A unique opportunity to savour the greatness of Northern Peru. A city tour in Trujillo, and the ancient Temple of the Sun and Temple of the Moon. 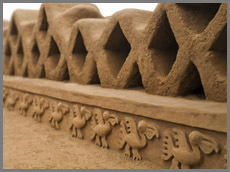 A worthy visit to Chan Chan, the world's largest mud-brick citadel followed by a relaxing afternoon at Huanchaco Beach. Finally, a priceless experience at the Museum of the Lord of Sipan and the Tucume Pyramids Complex.